The Art of Germany is a new 3-part series written and presented by Andrew Graham-Dixon for BBC Four. It is currently airing in the UK and is available for view and download via iPlayer. For those outside the UK that enjoy Andrew's work, part one can be viewed below. The first episode of The Art of Germany focuses on the Middle Ages and The Renaissance, but does seep into the Baroque as well. I found AGD's description of the organic nature Gothic architecture very interesting. Indeed he relates a lot of German art as originating from a primordial source in tune with the German forest landscape, a description explored by writers from Tacitus to Goethe and beyond. What really comes to the fore in this series is AGD's love of history. Whilst he does spend some time discussing artists' techniques - he always goes to great lengths to set the scene in a historical sense - something which I really enjoy about his work. Like many, my first exposure to German Renaissance Art was Dürer, whose prolific career is fascinatingly related. This episode also explores rich examples that help develop a much clearer picture of the German Renaissance beyond Dürer - deeply influenced by Medieval and Netherlandish stylistic markers, as well as local folkloric iconography. 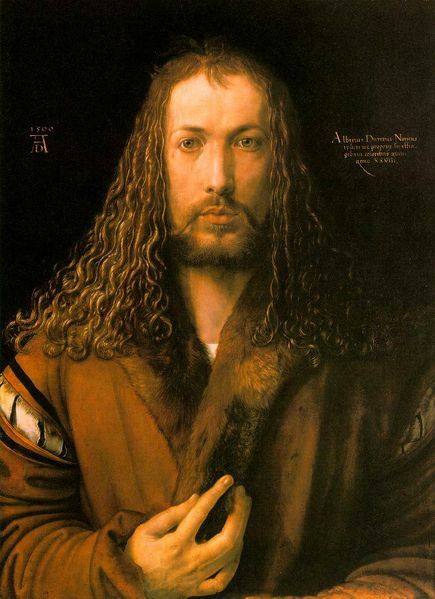 Particularly intriguing was AGD's description of Dürer as the 'exception to the rule' - not typical of a German artist of his day - due to his Italian exposure and influence. It was also nice to get a glimpse of the Crucifix of Gero(955-970) at the Cologne Cathedral - something which was recently covered by Monica Bowen in a superb post at Alberti's Window entitled Crucifix of Gero Conundrum. In somewhat related news, it was interesting note that BBC recently announced plans to make iPlayer available internationally in 2011 - with either a subscription or ad supported service. I welcome it - as long as they allow remote embedding so we can link to clips! Hello Vicky - thanks for bringing that up! I need to be more aware that I should include such details as non-art historians are most definitely part of my audience! That frontal pose is remniniscent of other Northern(eg. German/Netherlandish) portraits of Christ - the most commonly cited precedent is Hans Memling's Christ Giving His Blessing which was completed in 1478. Memling is another true star that deserves far more attention. I hope to be posting about him in future as well. What a fun post and video! Thanks for including the link to my crucifix post, as well. Vicky, "Christ-like" aspect of the portrait has to do with the gesture of Durer's hand. His hand is raised in the "salvator mundi" gesture, which is found in other artistic depictions of Christ. (The Memling painting that Hasan linked above also has this same blessing gesture). You can read a little more about this Durer portrait and interpretation on the last paragraph of this page (part of the "Changing Status of the Artist" art history textbook). Cheers for adding that extra detail M! Depictions of Christ are not my strong suit...depictions of Storks loitering on rooftops and exploding cucumbers seem to be my niche! ha! Ha ha! Hey, that's a good niche to have, Hasan. As I reread my comment, I realized that I should have included the word "also" in my first sentence - I was trying to add onto your discussion of the frontal depiction of Christ. (I don't want to give the impression that your discussion of the frontal pose is insignificant; it's a very good connection and observation). It also must be noted those frontal depictions were not something revolutionary that Renaissance artists thought of, but a centuries old visual tradition inherited from the Coptic and Byzantine traditions - seen in both painting and Mosaic. Churches and Chapels were often decorated with large, frontal posed images of Christ. When Andrew discusses the Isenheim altarpiece he repeatedly mistakes St Anthony the Abbot for St Jerome. Jerome does appear in the altarpiece, not in the painted sections, but only in the inner carved part.